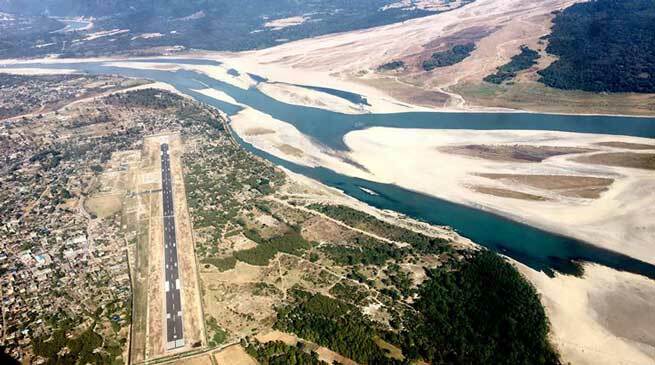 Civil Terminal of Advance Landing Ground, Pasighat is all set to be operational and will be in the country’s aviation map soon” informed Vinod P Kavle, Secretary of Civil Aviation, GoAP. Before giving a go-ahead, Secretary Kavle along with team officers comprising DC Tamiyo Tatak, SP Pranav Tayal, Director R. Roniya and Deputy Director T Ratan from department of Civil Aviation (GoAP), Flying Officer Akshay Sharma (IAF Dett. Cdr. ), ZPC Kaling Dai, PMC Chief Kaling Doruk and HoDs in a joint inspection stringently studied all aspects of the facility related to safety, security and other operations in and outside the terminal building. Kavle mentioned here that the State’s Chief Minister and Chief Secretary have held a series of meetings to make Pasighat ALG operational immediately for commercial flights by September, 2017 and the Secy. Kavle has been sent to ensure by both to take stock of ground reality. During his visit the secretary expressed satisfaction over the progress and but gave specific instructions for certain modifications of the existing facility of the civil terminal works including all other features that passengers and airline required under Regional Connectivity Scheme of GoI also called UDAN without facing any difficulties or logistical issues. He also directed to put in place ambulance, fire-tender, trolley for lifting of baggage, necessary security personnel, electronic equipment like HHMD etc apart from early construction of arrival/departure between civil terminal and ALG runway. Thereafter Kavle also visited the construction site of the upcoming Pasighat outdoor stadium wherein high rise concrete structures facing ALG in the eastern fringe objected by the IAF have been cleared by removing the same by the DD (UD) which is the executing agency of the stadium. Earlier this morning in a meeting with the vising Secretary, East Siang DC Tatak informed on trimming of high-raised trees, proving of ambulance with adequate paramedical staffs by the JDHS(T&R) Pasighat, 100 Kva power supply (with backup facility), safe drinking water, parking place, ticket counter, security control and monitoring room (with CCTVs), plantation and beautification of the area etc would be taken care of on priorities as desired the Secy. Two rooms for crew members and furniture were urgent requirement of the hour, he also felt. SP Tayal briefed about security arrangement while the Director of Civil Aviation R. Ronya updated the progress, presenting a detail report.